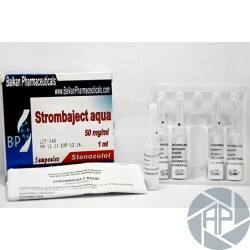 Strombaject Aqua is a modern steroid SC Balkan Pharmaceuticals SRL. It could be called an analog Winstrol since injectable stanozolol is also based on an aqueous solution. This is an excellent choice for muscle growth of high quality. The drug promotes muscle growth, which does not retain water and does not cause an increase in body fat, but on the other hand, has a fat burning and the deduction of the action of excess water. Strombaject Aqua in the Balkans is also valuable for its ability to increase the basic physical performance of the athlete. Improves the characteristics of power, increases the strength and performance, therefore, is relevant not only in bodybuilding and power disciplines, but also in the athletic sports. 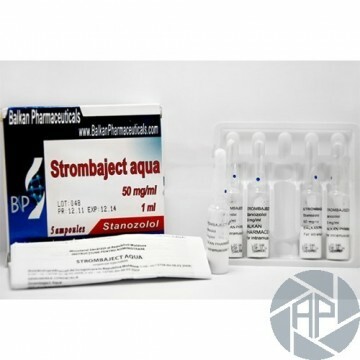 To describe the effect of Strombaject Aqua, it is necessary to take into account that the drug is a strong anabolic with minimal androgenic activity (despite this, the side effects of virilization or masculinization in the application is likely, especially in the predisposition and abuse). The steroid has a high bioavailability and stability, however, the period of its activity after the injection is not the longest. the half-life of the substance since the application is approximately 8 hours. We will observation: Strombaject Aqua (50 mg) on the basis of a substance stanozolol. An anabolic steroid is and was released at the beginning of the second half of the last century. Initially, "stanzas" (well known slang name) produce only for medical and veterinary use less frequently, however, due to its anabolic properties and burning fat quickly spread to sports. Until today, this steroid has a long history of use as a drug sport and its importance is not lost. What results is it doable using Strombaject Aqua? The drug is often used for drying, since it promotes the burning of fat and the Elimination of excess fluid, as well as for muscular growth of high quality. During its course of improvement can be observed, is increase the rigidity of muscles and relief, increase endurance, performance and energy performance. This medicine is a good choice for athletes, novice amateur and experienced athletes, or even professionals. It goes well with almost any relevance to the practice of sports and anabolic androgen, whereas with a low risk of side effects. In accordance with practice, the optimum doses vary area Strombaject Aqua 30 to 50 mg per day. Such amount of steroid is usually sufficient to achieve the necessary improvements, if we're not talking about the pros who tend to use the slightly higher dose of stanozolol, according to needs. The frequency of use of the drug and duration of application can also vary, on average, the same is 1 injection per day or every other day, respectively, and about 6-8 weeks of total duration of the course. In most cases, medication is not used in the single, and courses with other anabolic steroids combined. If you have any questions about the best way to carry out the implementation Strombaject Aqua (50 mg), then this question can be answered, our consultants. professionals with experience in the Forum, including bodybuilding coach, give necessary recommendations and comments. This drug has proven to be an excellent combination means that you mixed perfectly and provides a synergistic effect in combination with the different properties of anabolic and Androgenic Steroids. If highlight some most popular chords, then, which, of course, applies to the use of the so-called aquamarine Strombaject Aqua and nandrolone decanoate drugs. A combination of testosterone propionate is also often used for drying with testosterone or acting for good muscle growth. Other possible options for the combination are methandienone, oxymetholone, trenbolone, methenolone or drostanolone. Collected by the combined use of steroids should be based on personal preference, experience, current physical form and the objectives pursued. To dry production are some packages for performance wholesale power - other, and in the short term for a set of muscle mass - the third. This can be called dubious regarding steroids for use. Even in the case of the reception for the sport in high doses if the following recommendations are not usually serious disturbances. According to the opinions, probably due to side effects Strombaject Aqua - is an increase in blood pressure and cholesterol levels increased. In addition, some athletes have noticed pain and discomfort after the injection. The rest of the drug is hardly peculiar side effects - excluded estrogen disorders, androgen - is unlikely. A separate issue is that training should not be exaggerated the weight of workers, since this can cause damage to the bottom of the joints and ligaments. Data for the initiation of the athletes experienced colleagues are one of the most reliable sources of information on sports drugs. In particular, a review of the aquamarine Strombaject Aqua in the Balkans can tell how to apply the steroid, which can be achieved during the course or side to fear effects. If you are interested in the views of buyers and simply apply these injections athletes, be sure to visit our forum. Here you can easily find the required information, or will be able to ask questions. At the Forum, there is an active debate about sports, makers of drugs and sport pharmacology. What in the drug say the athletes? In short, Strombaject Aqua (50 mg) of described the work of steroids which exhibit a pronounced dose effect is claimed. In the same complaints about side effects if they occur, are often the result of a misuse of the drug and not his fault. First of all it must be said that Strombaject Aqua price on mr-steroid - this is the offer more affordable. We try to offer the pharmacology of low cost and also the opportunity to save. How to save money? Due to the extensive system of discount. For detailed information about possible discounts please visit the "FAQ", where all necessary information is provided. 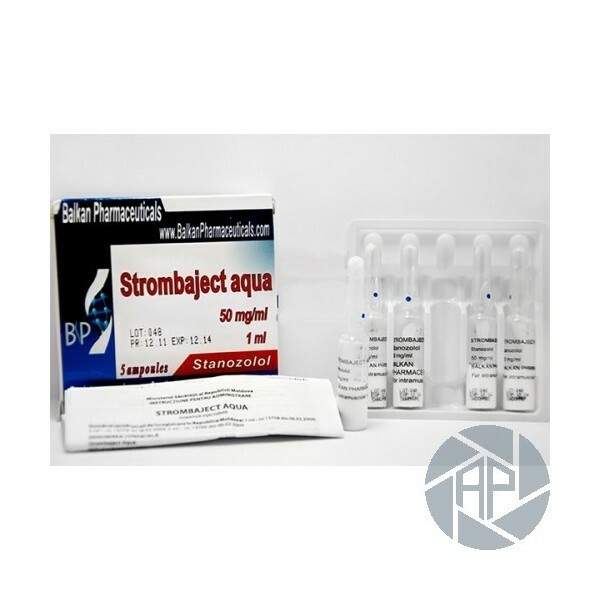 It should be noted that Strombaject Aqua (50 mg) than with an excellent service. This also applies to the speed and reliability. Make a booking with us at any time of the day, once its processing products are securely packaged and shipped in record time. If we talk about security, we only work with trusted suppliers and manufacturers of popularity, which is a good guarantee of originality pharmaceuticals. And one more thing: buy Strombaject Aqua, available in 1 ml vials with a concentration of the substance in 50 mg / ml, can be achieved in terms of anonymity. The reliability of the store is provided to protect the system. Important and personal information will never fall in removing unauthorized, which is important to make purchases on the Internet, especially when you buy steroids production and Pharmacology sports in general.